All-rounder Sean Williams (67 not out, 2-43) assisted Zimbabwe stave off a strong challenge from the United Arab Emirates (UAE) to win their Pool B World Cup game by four wickets at the Saxton Oval here on Thursday. Williams took two crucial wickets even though Shaiman Anwar's 67 powered UAE to a strong total of 285/7. During the chase, the African outfit were reeling at 144/4 when they lost star batsman Brendon Taylor (47). But Williams scored an unbeaten innings of 76 in 65 balls to chase down the target with two overs and four wickets to spare. 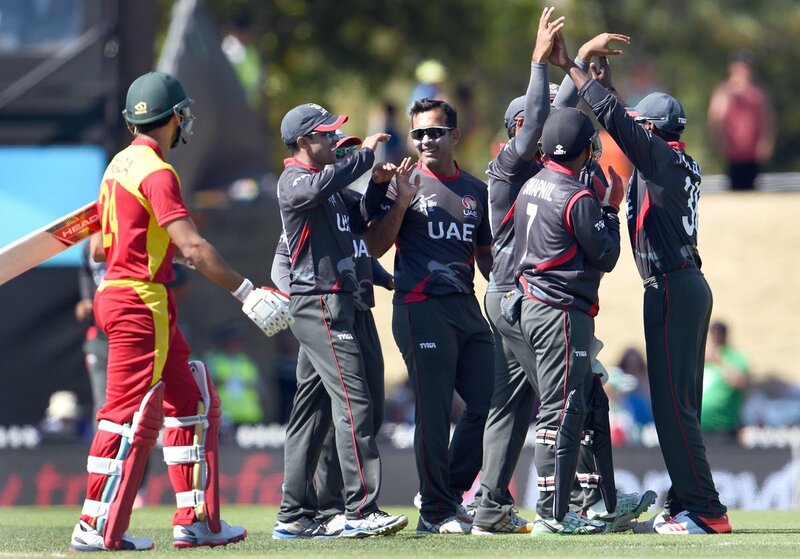 Zimbabwe won the toss an inserted their opposition in, UAE showed that there were no Pushovers. The two 82-run partnerships -- between Chandran (34) and Khurram Khan (45) and Anwar and S.P. Patil (32) was the sole reason UAE were able to get the better of their opponents in the 1st half of the game. In the beginning, opening batsmen Amjad Ali (7) and Adrin Berenger (22) lost their wickets to quickly for comfort and left their team in trouble at 40/2. However, Chandran and Khurram had a healthy partnership to give some stability to the innings. They put up an 82-run partnership for the third wicket before Chandran became a victim to Mire. UAE lost another quick wicket in the form of Khurram who looked strong and settled. This added to UAE’s stress as they were left at 134/4. Another partnership flourished for the UAE as Anwar joined Patil and they stitched an 82-run stand which ensured that UAE could cross the 200-run mark. Anwar's 50-ball knock was studded with nine fours and a huge six. The 35-year-old scored his second ODI fifty. Later, Naveed (17-ball 23 not out) and Amjad Javed (19-ball 25 not out) provided a late spark to the UAE innings, They forged a 53-run unbeaten partnership. which helped them post a challenging total of 285. For Zimbabwe, Chatara was the pick of the bowlers, taking 3/42. Mire and Williams chipped in two wickets a piece. However, a spirited performance by the UAE team was not enough to hand it a victory. In the pursuit of 286, openers Sikander Raza (46) and Regis Chakbva (35) gave Zimbabwe a brilliant start. But the UAE bowlers hit back by quickly dismissing Raza and Hamilton Masakadza (1). With the score at 72/2 in 15.1 overs, Taylor joined Chakbva in the middle. But their partnership crumbled at only 50 runs as the latter fell trying to hit right-arm spinner Mohammad Tauqir. Taylor soon feel to the trap of offie Nasir Aziz in front of the stumps This left a major question on Zimbabwe's chase with the score reading 144/4 in 27.3 overs. Solomon Mire also threw his wicket to Mohammad Naveed to leave the team reeling at 165/5 in 32.4 overs.28 year old , Williams was the Angel in disguise for his team and was aided by Craig Ervine (42).This duo put up an 83-run partnership for the sixth wicket to not only bail the team out of trouble but also put themin a commanding position. The 3rd Powerplay was utilized to the fullest by them and scored at a very good pace to bring the team into contention. After Ervine departed, skipper Elton Chigumbura (14) was Williams backbone, who was hitting boundaries with ease. His 19th One-Day International (ODI) fifty ensured that Zimbabwe bag a win in their opening game against the Cup debutants. For the UAE, Tauqir picked up 2/51 while Naveed, Amjad Javed, Aziz and Krishna Chandran took a wicket apiece. The match between Zimbabwe and UAE was hard fought. Both teams played positive and quality cricket. The associate teams have been performing quite well so far. It will be interesting to see whether they can cause a major upset in the tournament. UAE had their moments but their fielding and defensive captaincy let them down. There was no consistency in their batting and a few of their batsmen showed up will the others failed to prove themselves. This often becomes a team’s major worry, if the openers fail to give them a platform to build the innings onto, the team may often collapse under pressure. When big teams like South Africa, India, West Indies have succumbed to this it is nothing new that debutants wouldn’t. There were only a few sparks in the UAE innings that helped them setup a huge total despite their issues. Their bowling department was able to dominate Zimbabwe for a bit and this seems to be their positive. This team needs to mainly concentrate on their fielding which is well below the mark, and if they wish to progress, this is one of the areas they should give importance to. Talking about Zimbabwe, even though they were disappointed with their fielding, which was not upto the mark, as they are a much better side. The best part about this team is that they have got dependable 8 batsmen in their side. They had lost 5 wickets, but still there were batsmen in the hut hence there was not much of pressure. When Ervine went in to bat, he was positive and he pulled the run rate down, which made life easy for the rest of the line-up. That's where they went wrong against South Africa, but today they showed some improvement on that. It's good to take the momentum from this game into their next match against West Indies. They got a good start and all the batsmen supported each other in some little way which helped them chase down their target. Rotating the strike and having wickets in the end was the key factor to their win. Their bowling was decent and some of their bowlers had a good spell. 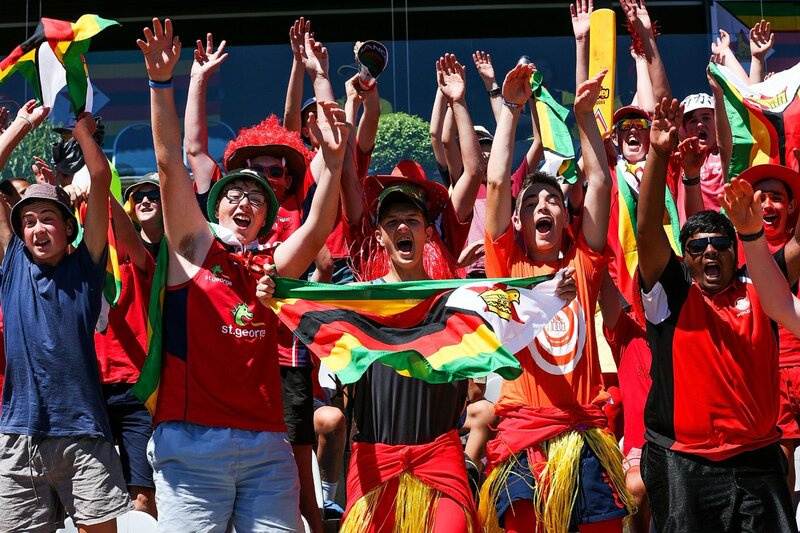 It was a tight game, Zimbabwe tackled pressure to win but result may well have been different had UAE shown greater self belief & aggressive tactics. Both these teams would look forward to covering their loop holes as the World Cup progresses. 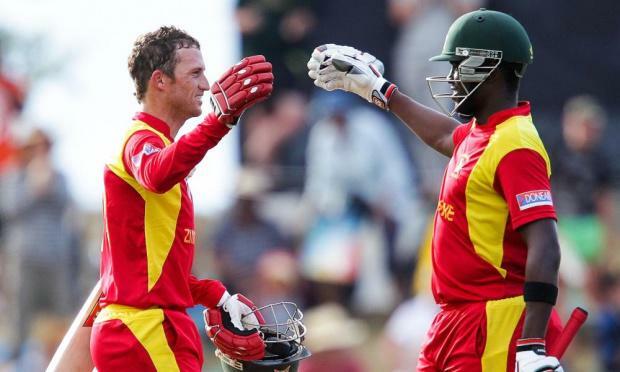 Sean Williams assists Zimbabwe to avoid defeat against the UAE.